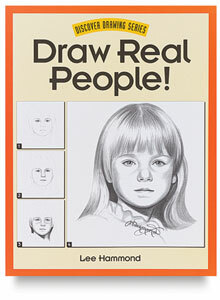 As you learn to draw people, you will need to pull together a tremendous amount of knowledge and techniques. It can be quite a steep learning curve at first, and the learning curve can last for a while. However, once you know the trick of mastering the human form you will find that, with practice, you will make steady progress. Keep it up! As your skills mature, you will be glad that you stuck it out. But why does drawing people present such a challenge, anyway? It's not that drawings of people are the hardest to make, it's just that they are the easiest to judge. You are so familiar with the structure and layout of your own body that you notice small inaccuracies almost always immediately. You can draw accurately with this method! As you learn to draw people from observation, you'd find that instead of directly drawing what you see, you tend to draw from memory and overemphasize the parts that you consider important. So the head ends up too large for the body, the face too big for the head, features too big for the face, and so on.... This instinctive information can become an obstacle to drawing what we actually see. When learning to draw people, my advice is to let go of the anxiety over 'getting a likeness' or making a picture that people will like. This way, you can concentrate on the fundamental principle of 'looking'. You will draw more truthfully what you see, and the likeness will come with time. First, spend some time tracing and creating the from photographs or a picture from a magazine or a book. Just make sure it shows the entire figure. The technique for this involves blocking the figures into simple large geometrical shapes such as rectangles, triangles, square or a combination of these shapes. Imagine that you are cutting silhouettes of people's profiles. Next, work on capturing movement and gesture. Gesture drawing, which is taught in many art classes, is a fun way to learn to capture movement in your subjects. You will become more aware of the twists and turns that make up a figure in motion. Get a glimpse of how to draw the overall structure of humans correctly, and then focus on the specific parts. Human faces are always fascinating subjects to draw. Learn a simpe way to draw a face in pencil. Return to basics and add some knowledge of anatomy to help you analyze the stance of your subjects. Many times, knowing a few details like the basic structure of the head can make all the difference in getting a likeness. Would you like to learn how to draw eyes?. The eyes are the window to the soul of your subject. Learn this easy way to get started. You can also read articles on how to draw noses, how to draw hands, how to draw hair, , ears, and discover the anatomy of hands. And don't forget to watch the video clip on how to draw a hand. Further, learn how to draw a mouth to add more emotional impact on a face. Improve the accuracy of your drawings with the sight sizing method. Sight sizing sharpens your ability to see and draw. If you want to be able to draw in the style of John Singer Sargent,, then give it a try. It's a good skill to add to your repertoire..
As you learn to draw people, you will tend to bring your own visual bias to the work that will lead you to make mistakes. So, keep these lists of common mistakes when drawing faces and common mistakes when drawing figures handy and refer to them when you are done with your drawings. Did you know that as you are learning to draw people, you will also have to apply the rules of perspective just like you would with other subject matter, such as still life or landscapes? Yep, the human figure is also subject to the rules of perspective. 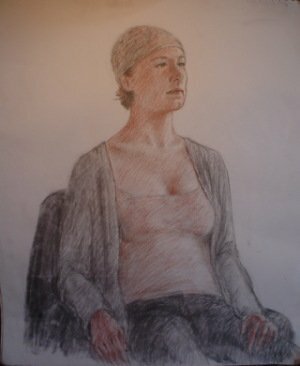 If you are mindful of them, then your drawings will come out so much better, and the process will be less frustrating. You are drawing a clothed model...Learn the basics of learning how to draw clothes on a person here. Mastering the human form takes patience and persistence but you can do it! To learn more and really push your drawing skills of people to a higher and solid level, visit the most comprehensive figure drawing resource here. Above all, enjoy your drawing and enjoy the the process for itself. When, with practice, you see more and more success you will enjoy it even more! Grab this tool to help you speed up your learning curve. I own one, and I often encourage many students to consider it.